Biosimulation is a technique in which computer programs are used for the simulation of biological processes. Biosimulation has wide reaching applications in the field of drug discovery and development of new drugs. It is a tool used for prediction and biosimulation is used to predict the future outcomes of current experiments related to discovery and development of new drugs. The process of drug discovery and development is a costly one, and the failure of the drug molecule in the late phase of drug development translates into a huge wastage of time, money and other resources. Hence, there is a need of a predictive tool that will aid in predicting the future outcomes of drug development by simulation of the biological processes involved. This is the most important factor driving the global biosimulation market. The other factors supporting the growth of the biosimulation market are the increasing expenditure on healthcare, development of advanced software and improved technology related to simulation. 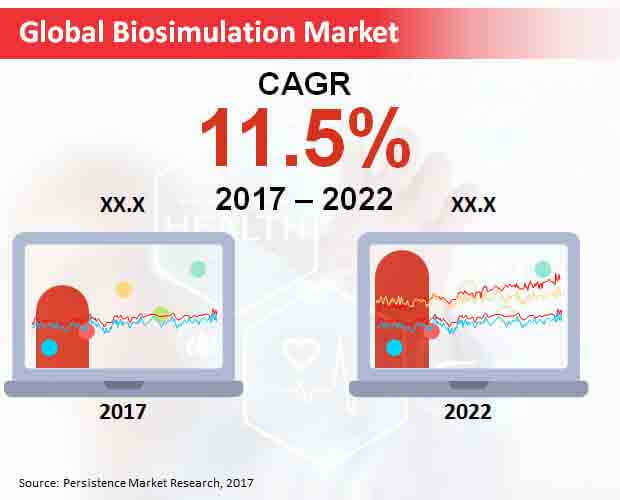 According to the assessment of Persistence Market Research, the global biosimulation market is forecasted to reach a figure of about US$ 1,750 Mn in 2022 and is poised to exhibit a robust CAGR in the period of assessment. The market in North America is set to dominate the global biosimulation market in terms of value and this trend is projected to sustain itself throughout the assessment period. North America biosimulation market is the most attractive market, growing at a robust CAGR over the forecast period. According to the projections of Persistence Market Research, the software product type segment is expected to reach a value of about US$ 1,050 Mn in the year 2022. This signifies a robust CAGR during the forecast period of 2017-2022. The software product type segment is estimated to account for nearly two-thirds of the revenue share of the product segment by the end of the year 2017 and is expected to lose in market share by 2022 over 2017. According to the assessment of Persistence Market Research, the academic and government research institutes segment is poised to touch a figure of about US$ 500 Mn in the year 2022. This signifies a CAGR of nearly 13% during the assessment period from 2017 till the year 2022. The academic and government research institutes segment is estimated to account for more than one-fourth of the revenue share of the end user segment by the end of the year 2017 and is projected to gain market share by 2022 over 2017. The report also profiles companies that are expected to remain active in the expansion of global biosimulation market through 2022, which include Certara, L.P., Simulations Plus, Inc., Dassault Systemes SE, Schrodinger, Inc., Advanced Chemistry Development, Inc., Entelos, Inc., Evidera, Inc., Genedata AG, Leadscope Inc. and Acceryls Inc.